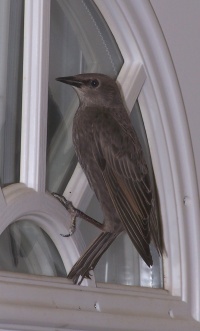 I got up this morning to find a bird had invaded my house! 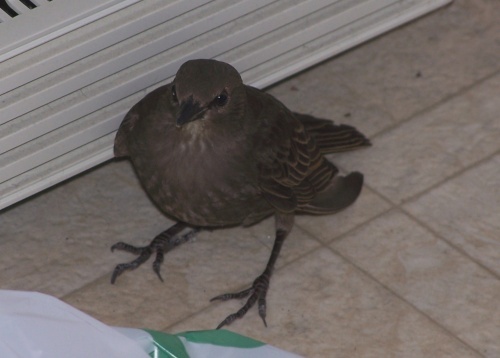 It got in through the air vent by the furnace, and flew out in a flurry when I opened the furnace room doors. 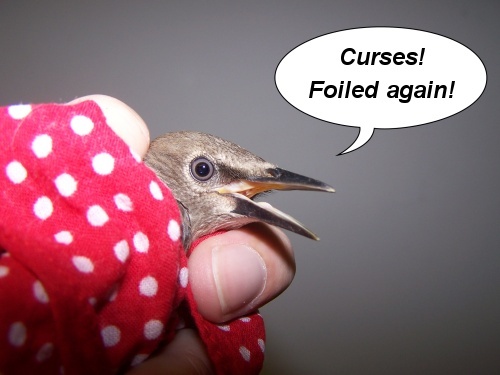 I managed to keep it trapped in the laundry room while I went to my bedroom to get my camera, but as soon as I opened the laundry room door again, it flew past me and into the kitchen! After about five or ten minutes of alternately flying into the living room mirror and into the front door window, the poor thing finally tired itself out enough that I could reach out and touch him. I couldn’t even get him to fly out of the house when I opened the front door for him and tried to chase him toward it. My first two attempts at grabbing the bird failed. I didn’t want to crush him, so I let him go as soon as he offered any resistance. I think the loud shrieks helped convince me to let him go, too. Then I remembered I had a handkerchief lying around, so I grabbed it and used it to cover the little guy’s head as I attempted to grab him again. Success! I’m not sure, but I think the bird was an immature robin. Someone broke into my car this morning, smashing the passenger side window and stealing my stereo. What a nice thing to wake up to in the morning. I’m not so much bothered by the loss of the stereo; that’s easily replaced. It’s the time have to spend now calling in an insurance claim, getting the window repaired, cleaning up the broken glass, etc. It’s the theft of my time that really bothers me. I got the set of core rulebooks for the 4th Edition of Dungeons & Dragons in the mail last Friday! I haven’t started reading them yet, since I want to finish reading the two Wizards Presents books — Worlds and Monsters and Races and Classes — which were released before the core rulebooks came out. The two Wizards Presents books cover the basics of the changes to the fourth edition of the game, along with the reasoning that went into many of the changes. It’s interesting to read how the game has evolved, and why certain decisions were made in this, the latest edition. So far, I have to give a thumbs up to just about everything I’ve read about the new edition. I’ve also started collecting some D&D miniatures for eventual use. They’ll be much more fun to use than numbered chits. The miniature packs contain eight random minis, and you don’t know what you’ll get until you open it. I got really lucky the other day when I picked up a couple of packs and got two monsters I was hoping for: a Gelatinous Cube and an Eye of Flame. I have to say the Gelatinous Cube is my favorite so far. A pseudo-remake of the original Death Race 2000 movie is coming out this year. My brother sent me a link that had some very, very nice photos. Hopefully this movie doesn’t turn out to be 90% “prison drama” and only 10% “death-racing action”. This brings to mind two good post-apocalyptic destruction car-racing boardgames: Thunder Road and Wreckage. Check them out, if your into board games and like this genre (though you’ll probably have to hit eBay for Thunder Road). It looks like bananas may become extinct in a few years. The fungus Fusarium oxysporum wiped out the previous species of bananas (the Gros Michel) in the 1950s. Now it’s back, having evolved to be able to take on the previously resistant “back-up” species of banana — the Cavendish — that replaced the superior Gros Michel banana after it was wiped out. This newly evolved form of the fungus has already wiped out banana plantations in several Pacific Rim nations, and may soon reach plantations in Latin America. Efforts are underway to breed a new strain of resistant banana, but because the bananas we eat are seedless, it’s difficult to introduce genetic variation into the breed. All Cavendish bananas we eat are clones, making them genetically identical and, thus, all equally susceptible to the same diseases. So, enjoy your bananas while you can.